Treatment: Symptomatic treatment, Traditional Chinese Medicine and physical rehabilitation therapy. Mr. HILAL A.AL SAMIE A.AL MALIK is a 36 year-old patient from Iraq. One day, 18 years ago, he woke up in the morning and found that his left eye could not see anything. Later on he was diagnosed with Multiple Sclerosis. Medicine was given through IV drip at local hospital but there was no improvement. His condition became worse in the next 6 years and his left leg developed movement disorder. He is a father of triplets, with 2 boys and 1 girl. However, he couldn’t enjoy his happy life due to sufferings from Multiple Sclerosis. Life was a torture to him. With years of suffering and no improvement from many treatments, his friend recommend him Beijing Puhua International Hospital. 3 days after submitting his medical reports through the hospital website(http://www.beijingpuhua.com/contact-us), he received an Evaluation Report from the hospital. From the Evaluation Report, he could find the treatment plan, treatment period, cost and other details. Upon receipt the evaluation report, he saw new hope for his life. He decided to go for the treatment and arranged his trip. He arrived China according to his appointment, and started the treatment as planned. The patient’s muscle strength of left lower limb was weak, he felt tired and could not walk for more than 50 meters. The visual range of left eye was only 10cm. Its difficult for him to write with his left hand. Mr. Hilal’s mental status, appetite and sleep quality were poor. His weight was decreased, and had to use wheelchair all the time. His body condition made him depressed. After admission, the patient has completed relevant examinations. 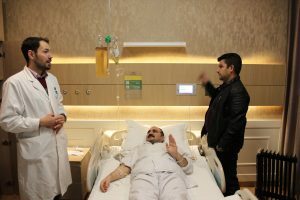 Then BPIH’s medical team has discussed his condition after thorough evaluation, several medical protocols were applied, including anti-platelet aggregation, acid-suppression to protect gastric mucosa, as well as medical improvement of cerebral circulation, nutrition and metabolism, combined with traditional Chinese medicine (TCM), rehabilitation therapy. Soon, his symptoms showed improvement. 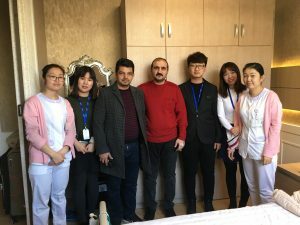 After 22 days comprehensive treatment, Mr. Hilal’s body movement is significantly improved: Muscle strength of four limbs has increased 2-3 degrees compared with admission. He can lift upper limbs and rotates them. He can bend his right hand and touch his face. He also can write easily. His speech is more clear. In addition, he can walk for more than 20 minutes. He even went to The Great Wall with his friend. During the hospitalization, Mr. Hilal’s condition improved day by day. He is very surprise but excited to see his improvements. He expressed his gratitude to BPIH’s medical team for their effective and professional treatment. He also speaks highly about the hospital’s nursing care and patient service. Before leaving the hospital, he expressed his thanks again: Thanks so much, Puhua has given me a second life. You are not only doctors and nurses, but also my family. We are looking forward to seeing more improvement from Mr. Hilal.